Red Sox public address announcer Carl Beane, whose warm baritone welcomed “ladies and gentlemen, boys and girls’’ to Fenway Park for nearly a decade, died in a one-car crash in Sturbridge Wednesday afternoon after suffering a heart attack while driving. He was 59. Beane, who became just the fifth PA announcer in franchise history when he won a competition for the job before the 2003 season, was pronounced dead at Harrington Hospital in Southbridge a short time after the crash. Golfers from nearby Hemlock Ridge Golf Course called police at 12:39 p.m. to alert them to the crash, according to Worcester District Attorney Joseph D. Early. 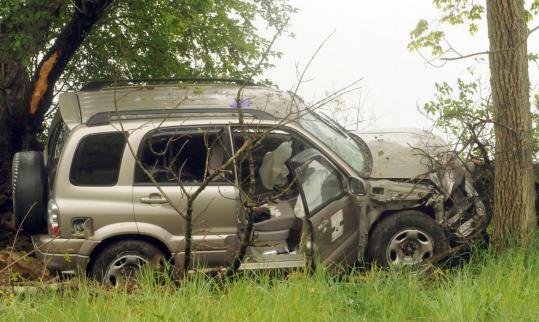 A preliminary investigation showed that Beane’s 2004 Suzuki was traveling northbound when it crossed double solid lines, left the road, and hit a tree and a wall. There were no passengers in the car. Red Sox personnel, in Kansas City, Mo., for a series with the Royals, turned somber upon receiving the news. “I’m shocked, just shocked. I know it was his dream job, very similar to me,’’ said Don Orsillo, the Red Sox’ play-by-play voice on NESN. Beane unabashedly cherished his role as the “Voice of Fenway Park’’ and took pride in following in the footsteps of the iconic Sherm Feller, who served in the role from 1967 until his death in 1994. Leslie Sterling and Ed Brickley held the position in the interim, but Feller and Beane’s elegant voices naturally linked them in Red Sox lore. And a place he immensely respected, as he explained to the Globe in 2003. But Beane did not take himself seriously, particularly with fans who upon meeting him would inevitably show surprise that such an authoritative voice came from such an unassuming 5-foot-4-inch man. Beane, a 1971 graduate of Agawam High School, was familiar at Fenway Park long before landing what he often said was “the only job I ever wanted’’ and earning accolades such as being the first voice in “The Baseball Experience’’ at the National Baseball Hall of Fame. For decades he was a prominent free lance radio reporter, producing audio feeds from interviews at Fenway as well as Patriots games. He began his broadcasting career at WMAS in Springfield in 1972, and also worked for WBZ-AM, WBRK in Pittsfield (1974-76), WARE in Ware (1976-94), and WESO in Southbridge (1994-98). He provided national updates for ESPN Radio, Sirius Satellite Radio, Westwood One, Associated Press, and MetroNetworks during his career. He even stepped in for Johnny Most on a Celtics game in 1979 when Most lost his voice after the first quarter. “I knew Carl for years when he would cover the clubhouse for his radio stations in Western Mass.,’’ said Red Sox radio voice Joe Castiglione. “He was always so thrilled to be at the ballpark. Beane never lost his appreciation for radio; he filled in at WARE in Palmer Wednesday, doing the morning show from 6 to 9. He intended to do the same Friday. WARE owner and general manager Bruce Marshall said Beane seemed fine when he left the station and was going home to take a nap. Beane is survived by his wife, Lorraine; his daughter, Nicole; and his granddaughters, Maddie and Gena. The Red Sox will pay tribute to him in pregame ceremonies Friday. Michael Vega of the Globe staff contributed to this report from Kansas City, and material from the Worcester Telegram and Gazette also was used.